I've always had an interest in making my own goat cheese.....mostly because I wanted to get goats as pets and my husband isn't interested, so I thought maybe if they serve a purpose then he'd be good with it. He's still not interested though - he said making goat cheese is a lot of work. I'm thinking he just doesn't want me to get a goat! 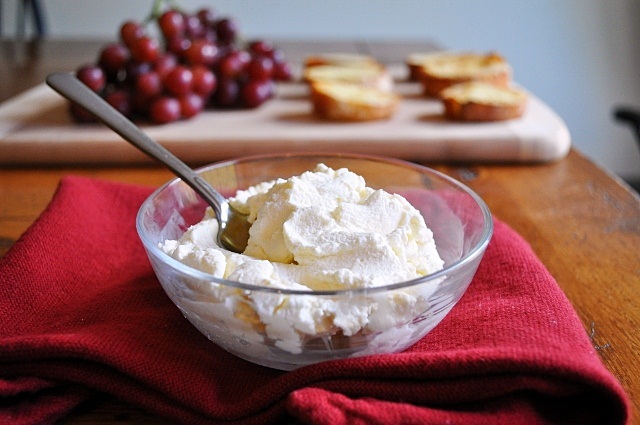 Anyway, I saw Ina Garten make ricotta cheese on her show a while back and I couldn't believe how simple it was! I had printed out the recipe and put it in my ever growing pile and forgot about it. Then this past weekend I had a little time on my hands, so I pulled out that pile of recipes I've been meaning to try and there it was. Since I had some whole milk needing to be used up I decided it was time to give making homemade ricotta a try. This turned out to be super easy, and super delicious. Big difference from store bought ricotta. This was smoother and creamier, and the overall taste was just better. Totally worth the effort/time, and from now on I will make my own. I love when I find things like this that take so little time...just goes to show, homemade is always better! Set a colander over a bowl, and line it with 2 layers of dampened cheesecloth. Add the milk, cream and salt to a medium sized saucepan. Bring to a full boil over medium heat, then turn off the heat and stir in the vinegar. Let the mixture stand for 1 minute, or until it curdles. Pour into the cheesecloth line colander and allow it to drain into the bowl beneath for about 20-25 minutes. The longer it drains the thicker the ricotta will be. Once it's reached your desired thickness, transfer the ricotta to a bowl and discard the cheesecloth and remaining whey/liquid. Will keep in refrigerator for up to 5 days. Makes 1 cup.